ARMAGH, Northern Ireland (CNS) — The leader of the Catholic Church in Ireland has urged Irish people and those of Irish descent celebrating St. Patrick’s Day to remember the plight of migrants. Archbishop Eamon Martin — St. Patrick’s modern-day successor as archbishop of Armagh — used his message for the March 17 feast to recall that St. Patrick was first brought to Ireland as a slave by traffickers. “This is so shockingly exemplified by the refugee crisis here in Europe,” he said. “Prompted by the situation of thousands of displaced people around the world, let us think about Patrick the ‘unlearned refugee’ (as he once described himself), the slave in exile, Patrick the undocumented migrant,” Archbishop Martin said. The archbishop pointed out that “St. Patrick’s experience of isolation and captivity as a teenager transformed and shaped his whole life and his relationship with God. His lonely time as a slave on the hills of Ireland became a transforming experience, where he felt embraced by the fatherly love of God. “I invite you to pray for refugees and for all displaced families at this time and, wherever you are, to encourage the hospitality and welcome for which we, Irish, are famous the world over,” the archbishop said. Meanwhile, to mark the eve of St. Patrick’s Day, Catholic and Protestant cathedrals in Armagh were to be illuminated in green. 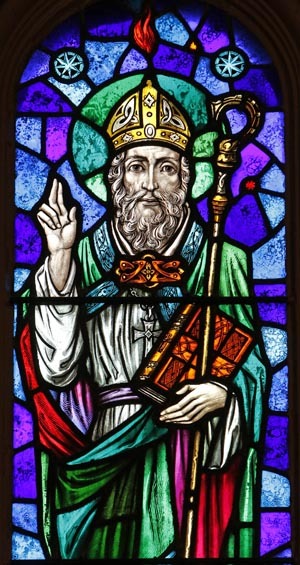 Tradition holds that St. Patrick founded the ancient see of Armagh. A vigil walk between the two illuminated cathedrals will begin at the Church of Ireland (Anglican) cathedral and move to the Catholic cathedral. Anglican Archbishop Richard Clarke will lead those gathered in prayer at St. Patrick’s Church of Ireland Cathedral, then guide the group via torchlight to St. Patrick’s Catholic Cathedral, where they will be welcomed by Archbishop Martin. Organizers said this symbolic expression of the unity of the churches reflects St. Patrick’s own journey of uniting the Irish people with Christianity.